Mechanised combat meets competitive sports in this PlayStation®VR exclusive. Set in the near future, RIGS Mechanized Combat League takes elements from different athletic fields, like combat sports, motorsports and basketball and mixes them into an explosive cocktail. At the heart of the game are the RIGS – fast, large, heavily armed athletic sports machines that you’ll pilot as you compete for glory. As pilot of one of these finely-tuned mechs, you’ll compete in a gripping single player experience that will push your abilities to the limit. Show off your skills in Trials to earn the right to challenge for the title in Career mode, or sharpen your team tactics in dramatic multiplayer matches in four incredible arenas around the globe, as you take on all-comers in the sport of the future. Rise through the Mechanized Combat Leagues in Career Mode, defeat your opponents to earn fame and fortune and turn your success into better RIGS and more experienced AI pilots to join your team. Show off your skills as a RIGS pilot in exhibition Trials to impress sponsors, earn lucrative deals for your team and obtain exclusive pilot gear. Whether you’re playing alone or teaming up with friends, online multiplayer modes have got you covered. Add two AI pilots to your team and challenge an opponent to a 1 vs 1 match; set up a friendly match against a PSN friend, or jump into an exhibition match against a randomly selected online player. Form a three-player team and work your way up the leagues to become Division Champions in a series of 3 vs 3 matches. Which rules will you play by? Put your RIG into overdrive and jump through the arena’s central goal – but beware of the opposition putting their RIGS on the line to defend it. Battle for control of a holographic ball and make a play for the Endzone – steal, pass and attack your rivals to keep control for your team. Flex your RIG’s muscles and smash you opponents to score points in this brutally simple but devastatingly tactical all-out war. Experience the awe-inspiring immersion and nerve-shredding aerial dogfights on the edge of deep space with EVE Valkyrie on PlayStation®VR. RIGS Mechanized Combat League has been out for a month, and we’re delighted with the response from players. Your words of praise, excitement and encouragement have been absolutely wonderful. In turn, we have some wonderful news for you! At Guerrilla Cambridge we try to listen to all player feedback, whether it’s compliments or criticism. We’ve […] The post Free RIGS Mechanized Combat League December update detailed: new arena, Rigs, weekly trials, more appeared first on PlayStation.Blog.Europe. 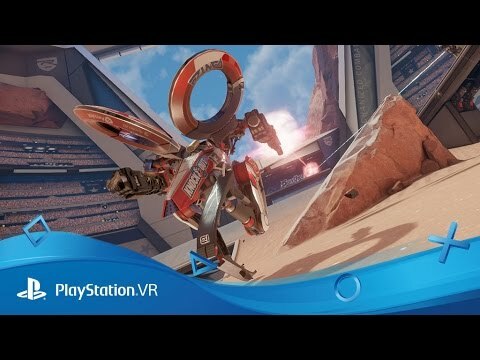 Over the course of RIGS Week, we’ve shown you a lot of exciting information about our upcoming arena-based shooter for PlayStation VR. We’ve acquainted you with the powerful RIGS chassis types, each one of them able – if used correctly – to turn the tide in your favor. RIGS Mechanized Combat League is a competitive […] The post Adapt and win: A guide to the different abilities in RIGS Mechanized Combat League appeared first on PlayStation.Blog.Europe. At PlayStation Experience 2015 in Moscone West, San Francisco, we were overwhelmed by the enthusiastic response to RIGS Mechanized Combat League. Players donned the colours of the Dynamos and the Cobras and pitched head-first into battle for their teams. Over the course of the event we saw rivalries grow, siblings duking it out for dominance […] The post Greg Miller shoutcasts PlayStation VR shooter RIGS Mechanized Combat League in new video appeared first on PlayStation.Blog.Europe. Last night in Paris, we showed off a full RIGS Mechanized Combat League match and debuted a new trailer for Guerrilla Cambridge‘s upcoming PlayStation VR shooter. Not watched it yet? Head on over to the dedicated guest post from Guerrilla now to take a look. Still want more? We called in at the studio in […] The post New RIGS Mechanized Combat League video: how Guerrilla Cambridge is creating a VR FPS appeared first on PlayStation.Blog.Europe.